The State Division of Water Resources is urging people in the northeastern part of the state to avoid contact with bright green or blue colored water in the Chowan River. The algal bloom about 12 miles upstream of Edenton has lingered in the area since June 20. Water samples have identified the species of algae as Dolichospermum, which usually appears bright green but changes to a milky-blue when it starts to decay. There's often a strong, foul smell assosicated with the bloom. Officials warn the algae bloom can easily spread to other areas. Researcher with the Institute of Marine Sciences in Morehead City Dr. Hans Paerl has studied algal blooms in the Chowan River. He says a combination of nitrogen and phosphorus coming into the waterbody from runoff, groundwater and the atmosphere mixed with high temperatures exacerbate the seasonal bloom. Paerl says it's possible the algal bloom in the Chowan River could eventually impact the Albermarle Sound. According to the State Division of Water Resources, there’s been no reports so far of adverse health effects in people associated with the algal bloom in the Chowan River. 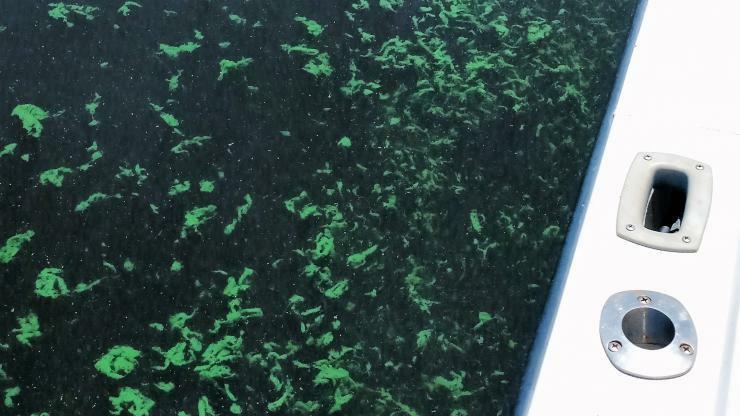 State health officials are encouraging people to avoid contact with large accumulations of algae and prevent children and pets from swimming or ingesting water in an algal bloom.